Last night I got to the hotel a little later than I expected, so I wasn’t up as early as usual. I did manage to get some work in on I,Q2 this morning, and bit more this evening. I hope to have a more productive day tomorrow. I’m in Chillicothe, Missouri. I spoke at Central Elementary school this morning to 5th and 6th grade and had a great time. This afternoon I spoke to 8th graders at Chillicothe Middle School to 8th grade and I’m back there tomorrow. So, I’ll wait to post about that visit until then. I got these great photos from my friend Scott Kiser at Meyers Elementary in Oregon. 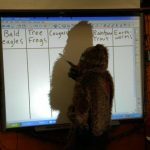 He has a student teacher who read my novel “Sasquatch” and decided that he would dress up as Big Foot to teach a lesson about temperate rain forests, in which there are supposed to be a lot of Sasquatch. I wished I’d been there for the lesson. I am Scott Kiser’s student-teacher. 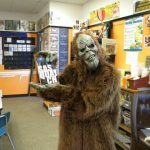 The students love your novel “Sasquatch.” It has been a great addition to our temperate rain forest unit and has opened up opportunities to discuss the novel in multiple ways. I’m glad you like the pictures! I loved the photos! You’re going to go far as an educator. I imagine that it was a bit warm inside the Sasquatch skin. The things teacher’s do for their students. Amazing!